Lying on the couch and reading notes alone in the living room. With the TV on although I'm not watching, because I don't wanna be in a lonesome aura, at least with some noise around me. I will feel better and of course a 'peace' of mind. All in sudden inspirations flow and the writing neurons are activated. Maybe I just wanna practice before my writing exam. Feel like writing about kisses. Maybe it has been a while. Kiss,an expressive action on love, not limited to our spouse, but friends or families. There are many type of kisses but I love the forehead kiss the most. Not involving the sporty action of both on the tongues or lips but just a soft light touch. Not too lively like French kiss or as harsh as vacuum kiss. It may be a kiss that doesn't carry any in depth meaning of love, maybe just a friend but with full respect and caring. For me, it's a sign of being loved and having a significance status for someone, in the heart, important and couldn't live without. It's like a kiss from dad to the daughter, it shows full pampered and eternality. In fact, it brings up a sense of secure and responsibility as well, a long life duty. It's romantic whenever forehead kiss is done when you are asleep or awake in the morning. Or even, it can replace the kiss on cheek, as a must-do-action before leaving. 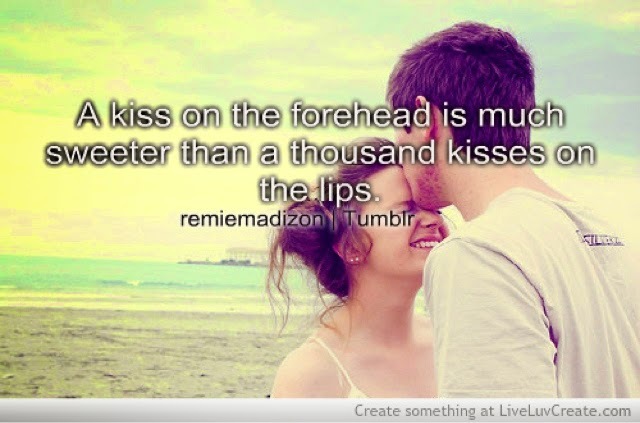 It means that he cherishes you as long as the forehead kiss lasts for seconds. It will definitely melt you, like Olaf smelts in the summer, yet he enjoys it much, with all joyful and without any regretness.